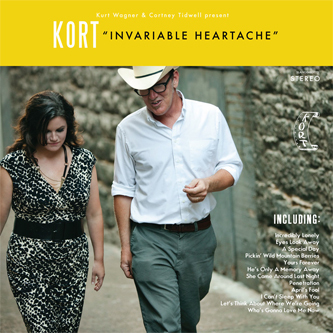 Both firmly ingrained in the fabric of Nashville life, Lambchop's Kurt Wagner and alt. country chanteuse Cortney Tidwell have reunited for an album that pays tribute to the noble art of the country duet, with a particular focus on the music released by the Chart Records catalogue. Cortney's grandfather, Slim Williamson, ran the Cart label, for which her father, Cliff Williamson, eventually became an A&R man. The family connection is completed by Tidwell's mother, Connie Eaton, who recorded for the same imprint. Kurt & Cortney (blimey) select eleven classics from the Chart archives adding one more that Cortney's mother had recorded for ABC Dunhill, and the results clearly stem from a real labour of love. All musicians and studio hands (among them Mark Nevers and Cortney;s usband, Todd Tidwell) are due much credit here, because Invariable Heartaches is an effortlessly well-turned-out creation that bears all the finest sonic hallmarks of Nashville's fine heritage, with sublime pedal steel propping up 'A Special Day' and slow-shuffling, brushed rhythms adding to the slow-dancing, weepy quality of 'He's Only A Memory Away'. A expertly realised and faithfully traditional set of recordings, Invariable Heartache might not be the most alternative-leaning of country albums, but that certainly shouldn't put anyone off - this is lovely stuff.